Born in Baltimore, he graduated from Dartmouth College in 1932 and earned his doctorate in chemistry from Harvard in 1935. He was a member of President Lyndon Johnson's science advisory committee from 1967 to 1970. He also chaired the National Academy of Sciences Committee for the Survey of Chemistry. Westheimer started his doctoral research with James Bryant Conant. When Conant became president of Harvard, he abandoned research and Westheimer finished his Ph.D. with E.P. Kohler. 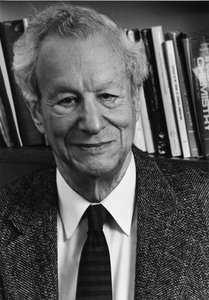 He continued as a postdoctoral fellow with physical chemist Louis P. Hammett at Columbia University who developed the field of physical organic chemistry, an area that captured Westheimer's interest. His first academic appointment was as a lecturer in chemistry at the University of Chicago. Here he was influenced by attending a course in physics by Kirkwood on electrostatics. He applied these ideas to their effects on the properties of organic compounds. He was also influenced by the development of statistical mechanics by physicists Joseph Mayer and Maria Goeppert-Mayer. He applied the principles of mechanics to the structure of organic molecules, a field that continues as "molecular mechanics" and finds wide application. He also applied this knowledge to the effects of isotopic substitution on the reactivity of organic molecules. His work on the magnitude of kinetic isotope effects is still the basis of understanding in the field. In the 1950s, Harvey Fisher, a student of his colleague at Chicago, Birgit Vennesland, was interested in the fate of isotopes in enzyme reactions. Vennesland had developed a project involving the fate of hydrogen atoms in alcohol dehydrogenase. Vennesland and Fisher's results were puzzling in that a specific hydrogen in the pair at C1 in ethanol appeared to be uniquely reactive in the presence of the enzyme. Westheimer joined the project with Fisher and soon provided an explanation based on what is now known as enantiotopicity. He designed additional experiments that proved the conjecture and established isotope-based chirality. Soon after completing the work on alcohol dehydrogenase, Westheimer moved to Harvard where the chemistry department was seeking to broaden the scope of research interests to include biological aspects of organic chemistry. He continued his interest in reaction mechanisms, isotopes and oxidation with a landmark study of chromic acid oxidations. He then reawakened his interests in phosphate reactions related to biochemical processes, an area related to his original doctoral work with Conant on fragmentation reactions. He proposed that ATP transfers phosphate through a reactive monomeric metaphosphate species. While this did not turn out to be the literal case, many enzymic reactions do proceed through transition states that have this as a significant component. He also approached the reactions of phosphate transfer through mechanisms that involve five-coordinate intermediates. He showed the significance of this route and the importance of stereochemical rearrangements of the intermediates. His work in this area set up the modern field and contributed to the understanding of reactions of RNA, DNA, and ribozymes. At the same time, he developed the idea of photoaffinity labeling of the active site of proteins. The identification of an "active site" is difficult in cases where proteins have hydrocarbon-rich sites. The photolabel generates a reactive carbenoid species that inserts into hydrocarbon C-H bonds. Westheimer's diverse interests led him through many paths in chemistry and politics. He was highly regarded, creative, and rigorous. His combined abilities in diverse areas made him an authoritative presence in any discussion. It is especially valuable to read proceedings of conferences (such as the Welch Foundation Conference on Bio-Organic Chemistry, 1971) in which transcripts of his comments are presented, to get a good idea of his approach. His demeanor of projecting a pessimistic outcome, while hoping for the best, earned him the sobriquet "Black Frank" among students. While he possessed a fine sense of humor, his ability to project a prediction of the worst possible outcome dominated how he was perceived. The attitude enabled him to question results with care and accept outcomes based on fact rather than hope. His approach to research involved attention to the key details that provide solutions to problems, while his papers remain engaging examples of clarity in scientific reporting. Among his honors were the Priestley Medal in 1988, the U.S. National Medal of Science, the U.S. National Academy Award in Chemical Sciences, and the Robert A. Welch Foundation Award, and the Nakanishi Prize in 1997. ↑ Ault, Addison. (2008). "Frank Westheimer's Early Demonstration of Enzymatic Specificity". J. Chem. Educ. 85 (9): 124. doi:10.1021/ed085p1246. Obituary at Chemical & Engineering News, April 23, 2007, Vol. 85, No. 17, p. 10.